When I think of differentiation at EG, there is one teacher that automatically comes to mind. Cliff Darnall has been teaching Japanese at EG for over 20 years and he frequently has 2 or even 3 different levels in the same classroom. Imagine having 5 preps spread over 3 periods! In Mr. Darnall's classroom, students are often divided so that one group works independently and the other receives personalized attention. Then they switch. All students benefit from manageable periods of total immersion and independent work. When I arrived to observe, one group was completing a formative quiz in the hallway while a second group was in the classroom discussing a listening passage. Because Cliff had built a good rapport with all students, he trusted one group to work independently and was able to give the other group very directed, personalized attention. He maintained a lengthy, input-based discussion in the target language and all students were engaged. Half-way through the class, the hallway group returned to receive personalized instruction from Mr. Darnall. The first group moved on to playing Quizlet Live*. 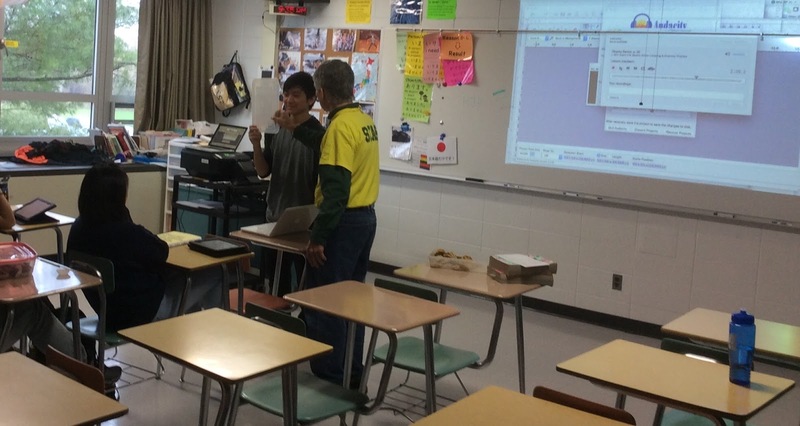 In order to pull this off effectively, Mr. Darnall had to trust his students to run the game from his computer while he projected visuals on the screen to discuss with the other group. Students in the Quizlet group were clearly comfortable with this. They automatically moved into teams. When one game ended, they restarted the game and shuffled teams. All groups that I observed working independently were on task and collaborative. re-start it after discussing first round answers. I give Mr. Darnall so much credit for the way he manages his classes. He must establish strong relationships with his students early on and instill in them a sense of purpose to get them working so well independently. Building on the foundation of class rapport, he is able to take risks like constantly trying new technology and turning it over for the students to run on their own. Thank you, Mr. Darnall for being such an inspiration! *Quizlet Live is an interactive game that takes vocab cards created in Quizlet and allows students to compete in teams. See this blog post or this instructional video for more detailed information. When Cliff Darnall plays, Quizlet Live recognizes that his cards are in Japanese, so the team names appear in the target language! This works for other languages too. There are choices and particulars to app-controlled RV choppers. This isn’t always the actual simplistic, child-friendly form of the UAV that some aircraft pilots presume so that it is. There are complicated details to the flight regulates and channels and also the chance to improve the visible experience Helizone.net.